Can someone give me some dimensions on how to do a WO with 15's? Like how tall should it be if it's 36 inches wide and 36 inches deep?? 2 inches taller than the subs, your going to have to angle the baffle alot though. blah, not 15.5 I meant to say 17 inches, my bad. You would have to angle the baffle to make it wider, to accomodate your 15", remember you can't just make the depth larger than 13.5" and be done with it. All of the WO's with the standard 36" width have a baffle thats about 11.5" wide when positioned in the middle. Angle it and you can change that to 15", but that would be a BIG angle! Yup, 17" high and angle the baffle. It should work, but alot of angle will be needed. You're right about the extreme angle. In fact the angle is so extreme that it won't work unless you also make the horn a little narrower. That will give you a little more room to work with. If you just leave it, the angle gets so extreme that the drivers will bottom out and won't fit. I know I've said before that I will take pics of mine, but this time I mean it. I know I've said before that I will take pics of mine, but this time I mean it. Here's the pics of the WO 15. The baffles are somewhat removable at this point due to the fact that you can't get the speakers mounted with them in place. I still need to come up with a good way of mounting the baffles and keep the ability to remove them. Whoa that is alot of angle. Good looking box though BigAir, i'd love to have a listen. what moves more air or is louder? 2 x 15 inchers regular excursion 250 wrms each? my point is if we want louder / more bass why not just use more powerful 10s' and a bigger amp? why mod the box to suit 15s? Your two examples may be on par with eachother, then again may not, there are alot of factors to think about. Why do people go for 15's though? Simply to hit lower frequencies and/or have more usable bass in those ranges. Why is this possible? It's just down to 15's having a substantially larger cone area than 10's or 12's. but the driver regarless what size moves backwards and forwards at the speed the amp/signal dictates,so if a smaller driver is moveing farther then doesnt it move as much air? Well, which would be louder would depend on the efficiency of your drivers. Yes, but a 10" driver would have to move quite alot farther than a 15" driver to make up for the lesser cone area. So the 10" would have to move roughly 2.25 times the distance of the 15" to achieve the same SPL at a given frequency. Of course thats assuming they both have the same sensitivity. Why compare long excursion 10's to regular 15's. That's comparing apple to oranges, right? If you're going through the trouble of building a WO for 15's because you want it to be louder, you might as well load it with powerful 15's just as would have loaded your 10" WO with powerful 10's. Line driver I think he means. 160db's? Am I the only one to call bs? you mean increasing the signal strength from the head unit from about 2 or 4 too 9? into the amp? dunno bout bs, whats the power output of the kicker?whats the world record for spl db now days? 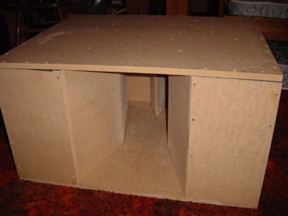 wo is a good desighn with 2 of steves subs and a good amp in a small space? I don't doubt it hits hard at all! sooooooo, If I angle it too much I won't have enough sealed air space for the subs??? The sealed chamber space shoudn't be effected if you angle the baffle correctly. Mark the centre point where the baffle is designed to go, and pivot it until theres enough angle to allow for a 15". Back to comparing long-excursion 10s vs. 15s there is a very good reason to go with larger drivers. The less the excursion the less the distortion and the less the strain on the driver. "Effortless" is the word for all the best bass reproducers. The less the driver moves to achieve the SPL the better. nice work guys, i was wondering what kindof mounting depth you had with the baffle at that extreme on an angle. Maybe i could invert the sub and fire into the sealed area? If i have to go with 12's my feelings wont be hurt too bad but having 15's would be nice. I built a 12 inch version with MTX thunder 9000's for a friend. MTX amp with 600 watts RMS bridged at 4 Ohms. I mounted the speaker inverted and in reverse phase. I calculated the speaker displacement and the amount of volume I lost in the sealed side when angling the baffle. Turning the speaker around kept the box volumes the same as before modification so the tuning would be the same....although I modded the port area to allow more airflow. 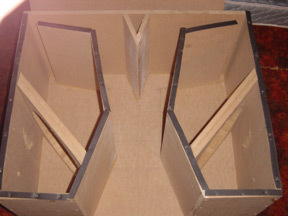 I also added some bracing in the ported side to take up some space....just try to keep your box volumes equal in ratio. Also a note of interest....Horn mouth size is in direct ratio with cone area. 15 inch speakers have twice the cone area as ten inch drivers. In my opinion the horn mouth should be twice the size then.... You decide. ?? ?